The Chicago Teachers Union said it is considering another one-day walkout as the district says it may have to end the school year early. 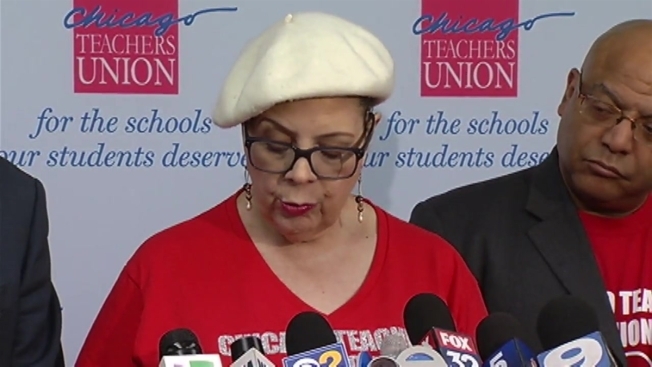 "If the board goes ahead with a threat of canceling three weeks of school, we would view their action as massive violation of our contract and that could provoke a strike," CTU President Karen Lewis said Wednesday. The union won't be voting on any possible strike just yet, however. Lewis noted that the House of Delegates would vote Wednesday on whether or not it wanted to open the idea up for discussion with the union, along with other "ways to respond to the crisis in CPS." "No union action will be taken until discussed and approved by the House of Delegates and general membership," she said. Chicago Public Schools said its school year could end as early as June 1 if its civil rights suit against Illinois isn’t quickly resolved, according to court documents released last month. The Chicago Public Schools Board of Education, along with five parents of CPS students, filed a lawsuit Feb. 14 accusing the state of Illinois of violating students’ civil rights by perpetuating an unequal funding system. In a statement, the Chicago Teachers Union called the suit a "cynical political ploy designed to divert attention from failed leadership and flawed decision-making of Mayor Emanuel, who has failed to adequately pursue progressive revenue for the city's school." The CTU said the mayor could "drain the TIF surplus and reinstate the Corporate Head Tax to plug this budget hole," adding the the district is "broke on purpose." The lawsuit is the latest development in an ongoing battle between CPS and Rauner, who vetoed a bill in December that would have injected the district with an additional $215 million in state funding to meet its June 30 teacher pension payment. Based on that veto, CPS announced the institution of a spending freeze on $46 million of non-salary funds on Feb. 6. The governor has been at the center of the growing battle surrounding CPS funding, most recently taking part in a failed meeting with Chicago musician Chance the Rapper, who then donated $1 million of his own money to the district while urging Rauner to "do your job." Rauner also traded barbs with Chicago Mayor Rahm Emanuel on Tuesday over his December veto. Should the union approve a strike, it would be the second one-day walkout in a little more than a year. Last year, teachers held a one-day strike on April 1. "What happened last year? We took a one-day strike and all of a sudden money materialized that hadn’t been there before," Lewis said. The union said this year, if a walkout takes place, it will happen on May 1, a day Lewis said will be "a massive day of protests." A final vote on the matter would be held in April. "Some people will say, 'Well if you strike won’t you be losing another day of pay?' But I would say if we don’t fight back, if we stay at home and they threaten us with furloughs and school closures, if we cower under the covers, then we are never going to stop these fights," she said.